Compassion and Choices is the oldest, largest and most active national nonprofit organization dedicated exclusively to improving care and expanding options at the end of life. 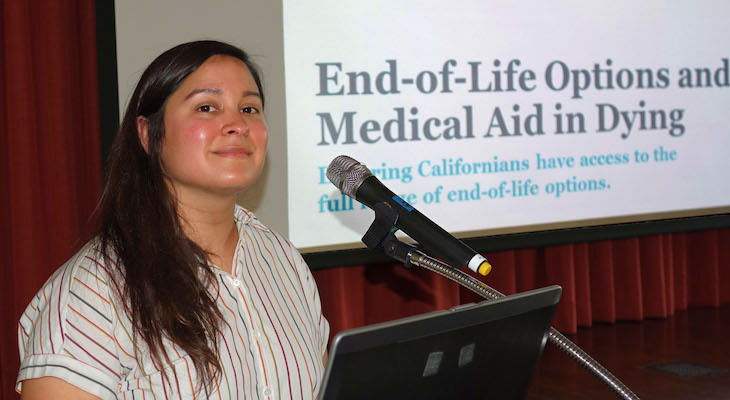 Public Outreach Manager Erika Ruiz of Compassion and Choices gave the Humanist Society of Santa Barbara an update on end of life options under the current California law. Here are all of my photos, as well as all of the presentation slides which Erika Ruiz kindly shared. Stephanie Elkins works with health care professionals. and in stories, endings matter. Ruiz's own father died of liver cancer in the ICU. It was not the death he would have wanted. He had been given six months to live, but was not informed of his options. Only 25 percent of patients die at home. Even though many more say they don't want to die in the hospital. Jennifer Glass was a medical aid-in-dying advocate who died at age 52: "I'm doing everything I can to extend my life. But no one has the right to prolong my death." Her efforts helped pass the California law. Unfortunately, she died before the law went into effect and she had a difficult death. VSED is common. It is painless if done under medical supervision. The patient typically enters a coma in about a week. And dies in about two weeks. But it is difficult for the family to watch. 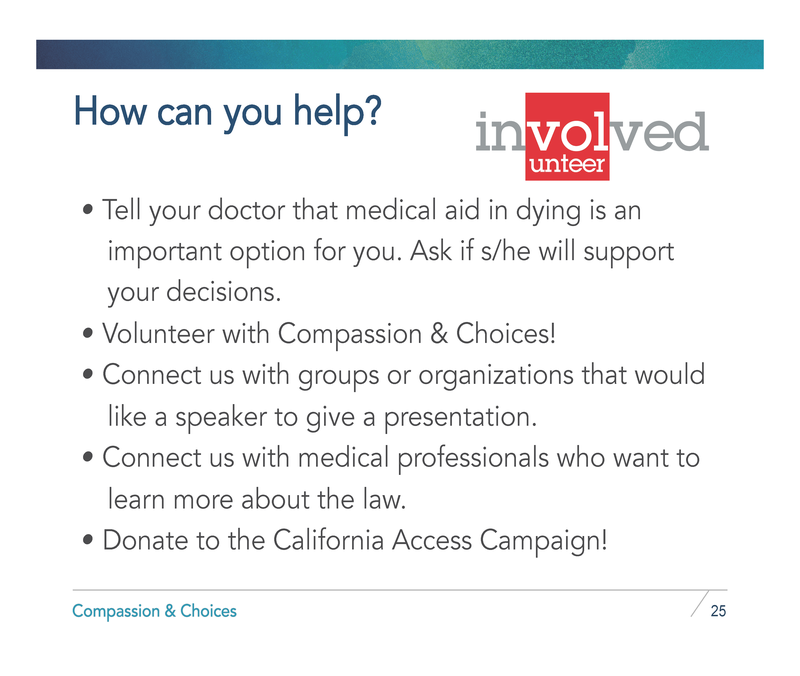 Medical Aid in Dying is what the new California law offers. It is sometimes known as "Death With Dignity". It has existed in Oregon for 20 years under that name. which a terminally ill, mentally capable adult with a prognosis of six months or less to live has the option to request from their doctor a prescription for medication which they can choose to self-ingest to end unbearable suffering and die peacefully." Medical Aid in Dying is authorized in Oregon (since 1997), Washington (2008), Montana (2009), Vermont (2013), California (2015), Colorado (2016), DC (2016) and Hawaii (2018). These eight jurisdictions cover one in five Americans. 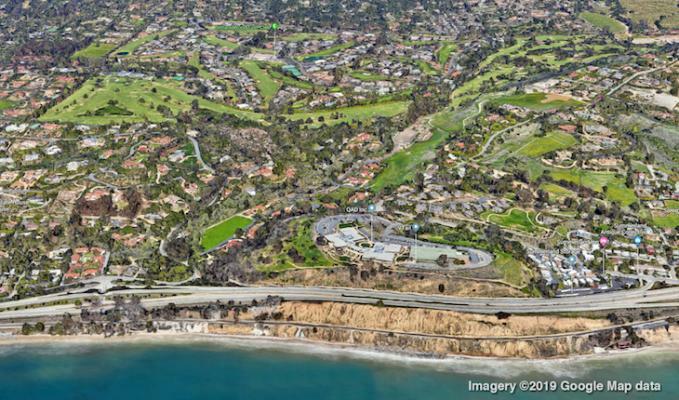 On June 8, 2016 a court case began against the California EOLOA. For three weeks the law was unavailable. 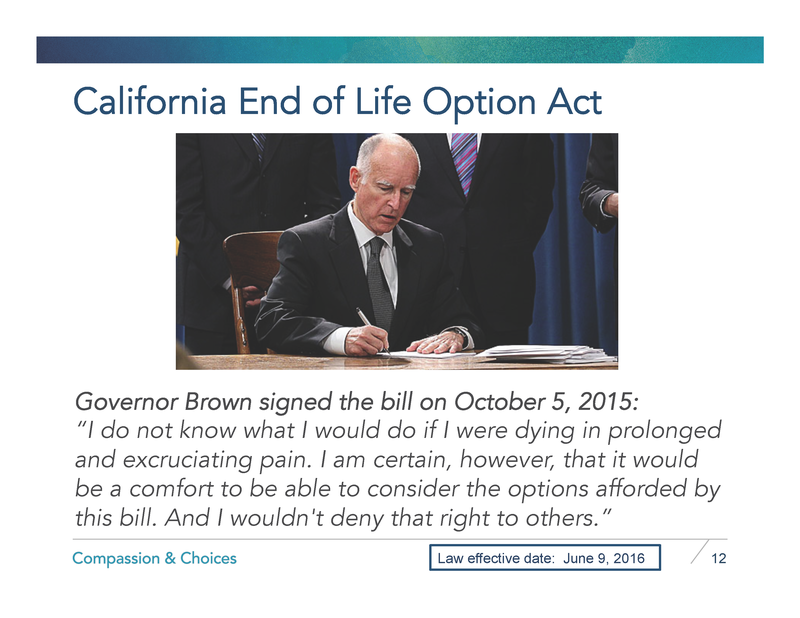 But a California appeals court granted a motion by two terminally ill adults and a physician represented by Compassion and Choices that stayed the law, keeping the EOLOA in effect. The current situation is operating under a writ of supersedeas which is a stay. A judge did not even rule on the case until 2018.The case is likely to take a couple of more years and will likely go to the California Supreme Court. In the meantime it is almost certain to remain in place. "I do not know what I would do if I were dying in prolonged and excruciating pain. I am certain, however, that it would be a comfort to be able to consider the options afforded by this bill. And I wouldn't deny that right to others." As for the last point: The protocol involves about 90 capsules! But it can be prepared by others and mixed into liquid form. Any organization can opt not to participate. But this is not a gag order. Any staff member can talk to you and make a referral. The law protects wills and insurance. It is NOT suicide. It does not even count as assisted suicide. Having the prescription itself is a comfort. That is why many do not feel the need to take it. 20 years of experience in Oregon have not shown a single case of abuse. It is recommended that you talk to your physician and be sure he/she will support your medical aid in dying decision. This conversation helps you and helps advance access for others. You should file a living will with your physician. This will allow the physician to create a Physician Order for Life Sustaining Treatment (POLST). The presentation ended with a brief talk by Barrie Lynn Kritch who has been diagnosed with cancer. She was from Santa Barbara, but had been living in Missouri for 40 years. 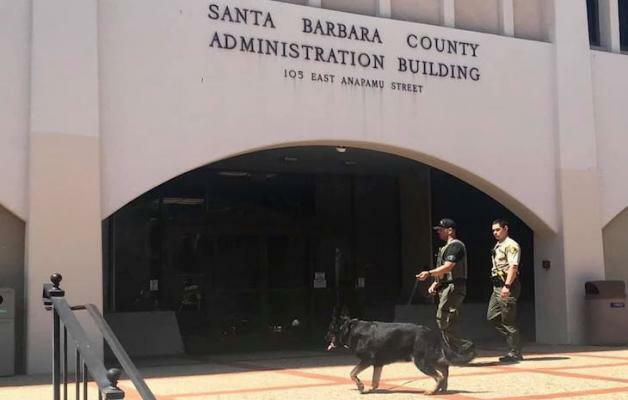 She moved back to Santa Barbara to be able to use the EOLOA. Some additional important information came out in the Q&A. There is a 15 day waiting period. But in real life it takes more like 4-6 weeks to get the prescription filled. An eternity for someone in great pain. This is why Compassion & Choices recommends discussing your end-of-life options with your doctor now, even if you are healthy. People with dementia are excluded. But VSED is still an option. It is important to designate someone to speak for you who is willing to fight for your desire. The same goes for talking to your doctor in advance to make sure he/she will help. Doctors are known to change their minds, so it can be helpful to have a second doctor as a backup. The Find Care tool will help you find a hospital. But doctors don't like to be on a list! You still have to talk to your own doctor. Then there is the issue of cost. In the past Seconal was used. Then the Pharma company Valeant drastically increased the price to $3-4K. Some insurance companies will pay for it. Some medicines are available for as little as $400. Medicare and the VA cannot cover it due to a 1997 lawsuit involving the Oregon law. But MediCal will cover it! We are fortunate to have dedicated, compassionate people like Erika Ruiz working to offer these end of life options. We are all encouraged to support Compassion and Choices with our time as volunteers and/or with our money. Well, people in Montana may believe a person should suffer unspeakable pain, like it or no, but no doubt some will change their minds when the time comes to endure their own "hell on earth". Thank you all for the kind words about Compassion and Choices, the talk and my article. BRADLEYMTAAS I am afraid I am not understanding your point. As the Anon responder said, if you don't want to participate in this option, no one is forcing you to do so. ========================================================================== As FLICKA said "We treat animals better at their end of life than humans who some believe should suffer unspeakable pain right to their end." ========================================================================== As LUVADUCK noted, we are supposed to have separation of church and state. Church "morality" should not be allowed to force suffering on people. Whether it is loving gays who are prevented from marrying. Or whether it is a person at the end of a fulfilling life who no longer wants to live in unbearable pain. ========================================================================== The biggest remaining problem is the case of a person who has known for years they want to die in such a situation. But they are deemed mentally unfit at the time. As FLICKA noted, we have kinder solutions for animals. 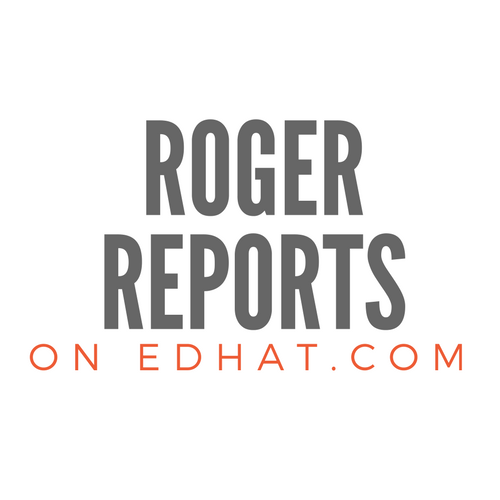 Thank you, Robert and Edhat. Clear and concise. I'm happy to know that, if needed, I have the option. Very calming. I love California. 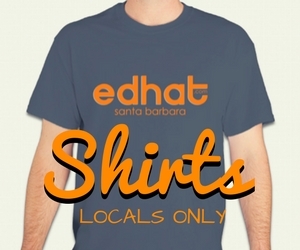 I love Edhat! A coworker's mom chose VSED but wouldn't go while the family was around. Finally everyone had to go back to work and school and that's when she passed. Seemed amazing to me. We treat animals better at their end of life than humans who some believe should suffer unspeakable pain right to their end. This is another personal-choice that various religions have controlled and falsely seek to control. While all religions embody beliefs and tenets some others don't, none should be allowed to dictate personal choices to outsiders. Further, if a religion supports the omniscience & omnipotence of their god that means correct judgement is not in human hands. A congregant who doesn't agree with the most basic tenets/beliefs of his religion's system, should vote with his feet. Humans should have the right to die with their dignity intact---especially when suffering unbearable pain. The right to die should be made inviolable. Thank you for this report. It's very interesting, although a bit discouraging, especially for those who do not have a doctor.